Insurance coverage for medical marijuana? Not anytime soon. Although support for medical marijuana is growing, insurers and healthcare plans continue to deny coverage for this treatment. Although support for medical marijuana is growing, insurers and healthcare plans continue to deny coverage for this treatment. This won’t change until marijuana is declassified as a Schedule I controlled substance under federal drug laws, which probably won’t happen anytime soon. Medical marijuana is now legal in 21 jurisdictions. Two states, Washington and Colorado, permit the recreational use of marijuana. Yet the distribution, sale, or possession of marijuana remains illegal under federal law. This dichotomy has raised concerns about how healthcare and workers compensation insurers handle demands to pay for medical marijuana. In addition to conflicts between federal and state drug laws, some have concerns that insurers or employers potentially could be liable for injuries caused by marijuana use. Because of these uncertainties, in 2013 the National Council on Compensation Insurance — a prominent workers compensation organization — identified medical marijuana as an emerging issue for the industry. Insurers may have valid concerns about having to pay for medical marijuana. However, workers compensation policies and healthcare plans don’t actually cover the treatment, and it likely will remain that way until the federal government reclassifies the drug under federal laws. Prior to 1970, marijuana was legal for medicinal purposes. This changed with the passage of the Controlled Substances Act, which classified marijuana as a Schedule I drug. The Act defines Schedule I substances as those that have a high potential for abuse and “no currently accepted medical use.” Thus, by definition, marijuana is deemed to provide no medical benefits. Because healthcare plans and insurance policies typically exclude coverage for experimental treatments, insurers may continue to decline payment for marijuana as long as it remains on Schedule I. This classification is difficult to justify. The Schedule I list includes drugs like heroin, which are much more dangerous and addictive than marijuana. Schedule II drugs include cocaine and methamphetamines, which supposedly have less potential for abuse than marijuana, or have some accepted medical benefit. Yet few would agree that marijuana is more dangerous than these Schedule II drugs. Despite the questionable rationale behind the classification, changing it won’t be easy. In 1994, the Drug Enforcement Administration (DEA) established a five-part test for determining whether a drug has a “currently accepted medical use.” The test’s most rigorous element is a requirement that there are “adequate and well controlled studies” proving the drug’s efficacy. The DEA has construed “adequate and well controlled studies” to mean clinical trials similar to what the FDA requires for new drug applications. This standard will be difficult to meet. 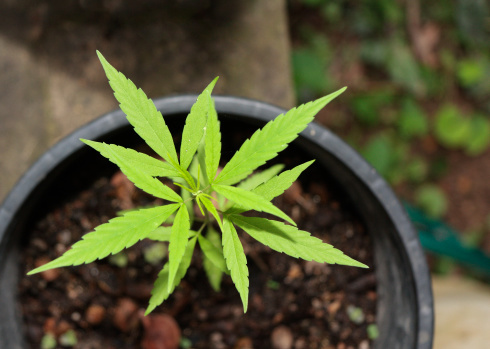 In 2009, Americans for Safe Access petitioned the DEA to reschedule marijuana. Two years later, the agency rejected the petition, noting the absence of any FDA-quality clinical trials confirming the drug’s value in treating any medical condition. Claiming the DEA ignored hundreds of peer-reviewed studies demonstrating marijuana’s efficacy, Americans for Safe Access sued to overturn the agency’s determination. The United States Court of Appeals for the District of Columbia Circuit upheld the DEA’s action. The court held that the petitioner’s peer-review studies lacked the rigor to meet the DEA’s standard for FDA-quality clinical trials. In October 2013, the United States Supreme Court summarily rejected a petition to review the ruling. The governors of Washington and Rhode Island also have filed a petition with the DEA to reschedule marijuana. In a new twist, medicinal marijuana advocates have suggested that federal restrictions on marijuana’s use and possession have foreclosed the large-scale clinical trials necessary to satisfy DEA standards. Even if successful, this new argument probably would not result in reclassification but simply in a loosening of restrictions on research. Unless there are large-scale clinical trials, the end result for the governors’ petition probably will be the same as in the Americans for Safe Access case. Even if marijuana were reclassified, patients still could have a difficult time requiring insurers to pay for the treatment. A rescheduling would not mean that marijuana has an accepted medical use within the meaning of most insurance policies and healthcare plans. Without FDA-quality clinical trials or formal FDA approval, medical marijuana might continue to be considered experimental, and thus excluded from coverage. In addition to plan and policy exclusions, there is no push at the state level to require insurers to cover medical marijuana. Although more jurisdictions permit the drug’s medicinal use, many state laws clarify that insurers don’t have to pay for the treatment. It might be just a matter of time before marijuana is approved for medical use on both federal and state levels. There is a groundswell of popular support for legalizing the treatment. In a sign of the industry’s growing legitimization, U.S. Attorney General Holder’s office issued guidance telling prosecutors not to prioritize cases involving legal marijuana businesses that use banks. As attitudes toward the drug change, the DEA might have a difficult time justifying its Schedule I classification. But changing that classification would just be the beginning of the battle on the coverage front. Even in those jurisdictions that favor legalization, there is a reluctance to require insurers to pay for medical marijuana. This hesitance probably stems from the perception that smoked marijuana is “alternative” medicine. For marijuana to become a covered treatment under most insurance policies, that perception would have to change as well.